The Labels and Databases is a label maker and designer software with seamlessly integrated database management tool. It allows to create labels, envelopes, and cards using various built-in label formats, and then print merge them with the information contained in user databases. Add database field objects, text, graphics and images, boxes, ovals, lines, patterns in any font, color or rotation, gradient fills, barcodes to your documents. Apply numerous image effects, like opacity level and image mask. 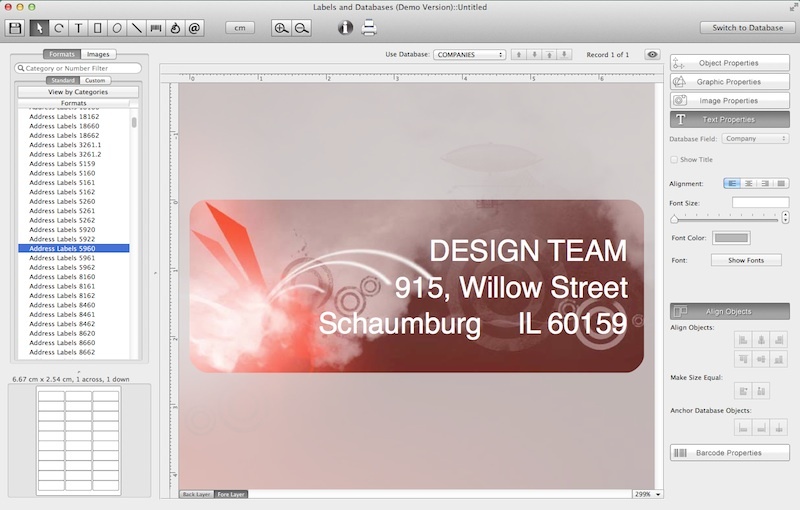 Easy switch between mac database and label views, instant previewing make the work with the label maker intuitive and quick. You can print labels from database, using either one database record, or a sequence of records. The Labels and Databases contain comprehensive list of label paper in the paper formats list. Print your labels on popular label stock from A-One, APLI , Avery, and many other U.S., European, or Asian manufacturers. Labels and Addresses also prints directly to popular label printers such as DYMO LabelWriter, ZEBRA thermal, and others. Print any number of labels starting at any position on the sheet, exclude certain labels from printing, control bleeds, printing offsets, crop and trim marks. The Labels and Databases integrated database module helps you to easily store and manage contact information (names, addresses, phone numbers, etc.). Database record consists of database fields, including image field, plus four customizable User Fields. It is easy to use, and sports a variety of powerful features to help you truly manage your contact list. Prints linear and 2D barcodes, text and images. It supports Postnet, Code 128, UPC-A, UPC-E, ISBN, Datamatrix, and QRCode barcode types. Barcodes can also be set to use print merging, that is barcode data is taken from database, creating sequential barcodes on printing, or exporting labels as graphic files.